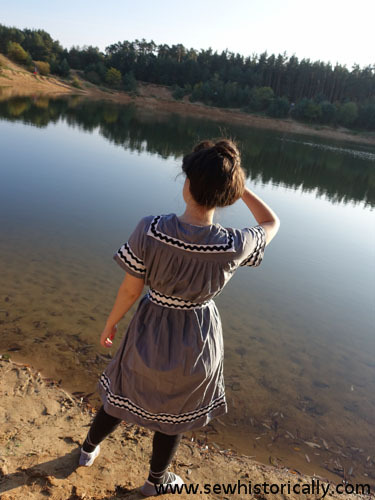 That’s my 1900s bathing costume. 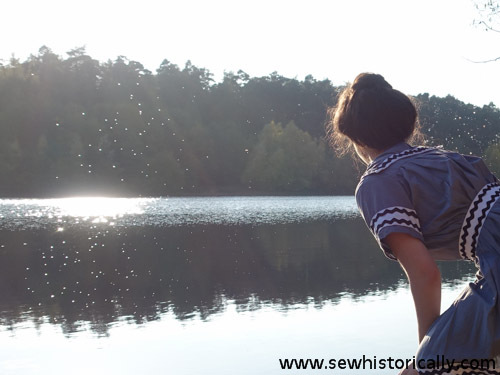 Edwardian bathing costumes were either made with wool, cotton or silk fabric. 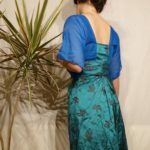 For my bathing dress I used blue cotton fabric. 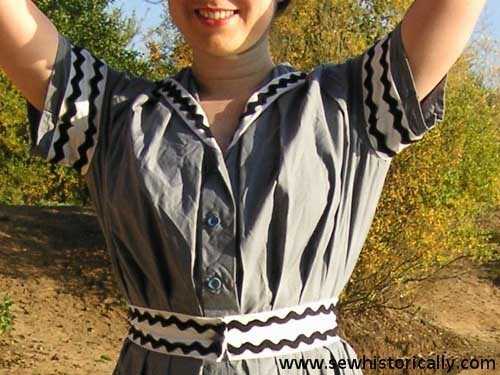 My Edwardian bathing costume has a sailor collar. 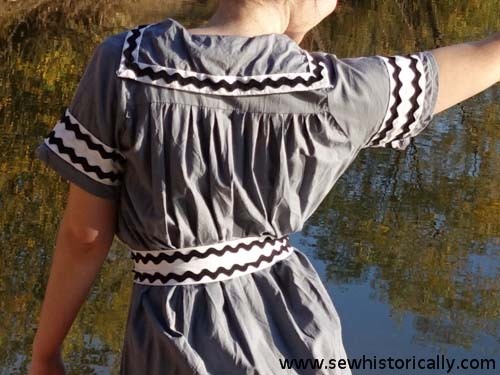 Edwardian bathing suits often had nautical details, like this 1900s blue bathing costume with white sailor collar. 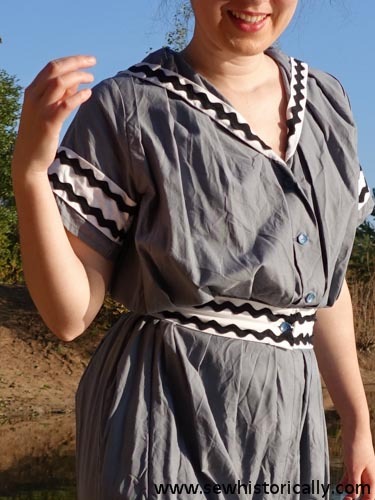 I used white cotton fabric strips and black cotton ric rac ribbon to trim the bathing suit. 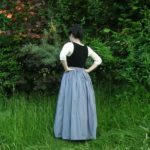 The bathing dress has knife pleats in front which are stitched down at the shoulder and at the waist under the belt. 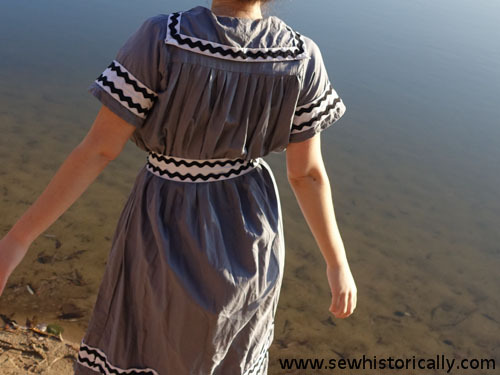 Here’s a late 1870s bathing suit with knife pleats at the front. 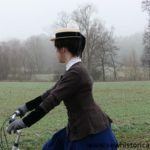 Edwardian bathing costumes were either made with the blouse and drawers in one part and a button-on skirt, or the blouse and skirt in one part and separate drawers. 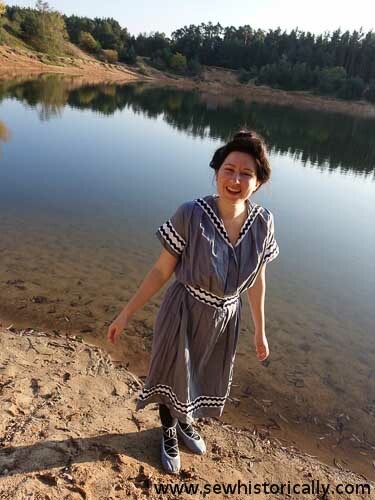 My bathing costume is like a dress with the blouse and skirt in one part. In the Edwardian era, bathing corsets were sometimes worn under the bathing dress (picture of 1902 bathing corset). But I’m not wearing one here. But because of the belt and pleats, the bathing costume gives the figure an Edwardian S-curve silhouette. 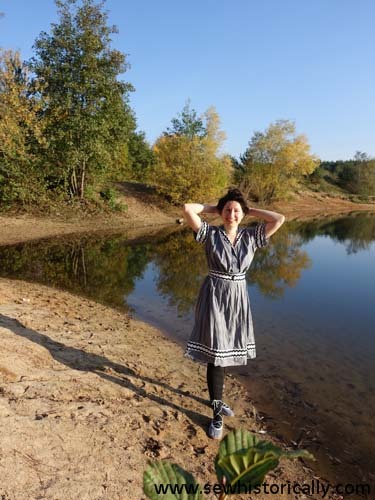 It was a beautiful, warm September day when we took the photos. I put my hair into an Edwardian pompadour hairstyle. Here you’ll find my tutorial for this easy and authentic Edwardian Pompadour hairstyle. I love the bathing costume 😀 – it’s comfortable to wear and so pretty. 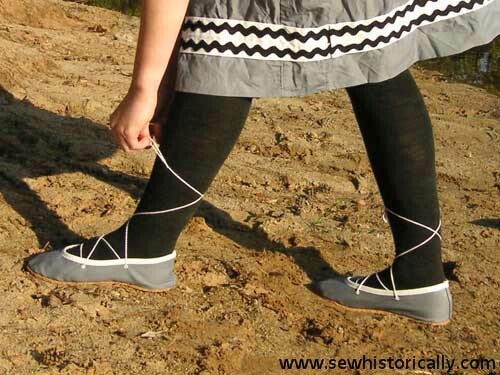 It can even be worn today as a sailor-style dress. 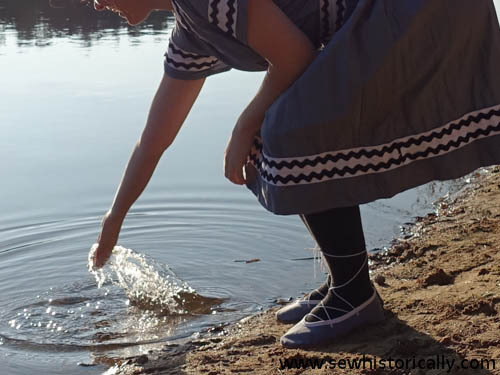 With the bathing costume, I’m wearing my matching DIY Edwardian bathing shoes with cork soles, which are made with the same blue cotton fabric. Here’s a picture of a pretty 1885 bathing costume with bathing shoes. In the 1900s, legs were never bare while bathing, but were always covered with stockings, usually dark wool stockings. I’m wearing black cotton stockings. 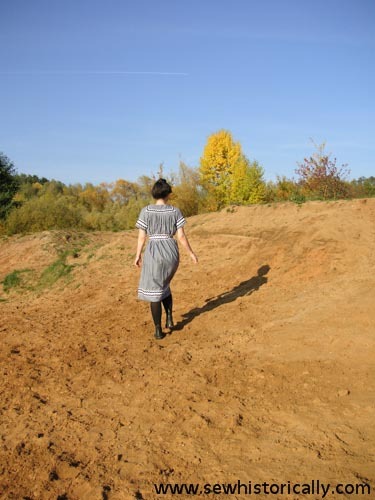 The shoes are comfortable to wear – a bit slippery on steep sand hills like here. Here you’ll find my pinterest board ‘1900s sportswear‘ with more 1900s bathing costumes. That’s such a lovely bathing costume. And cotton is an excellent choice. 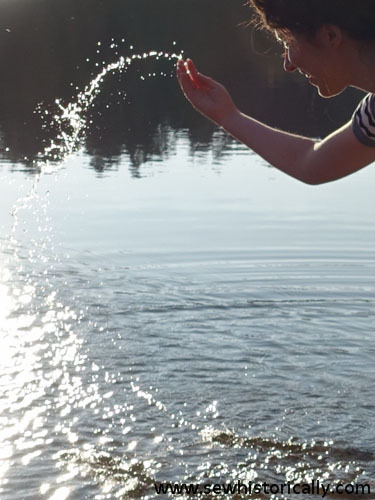 I cannot for the life of me imagine going into the water with wool on. Won’t it get wet and sink you? You did a wonderful job of recreating this piece! 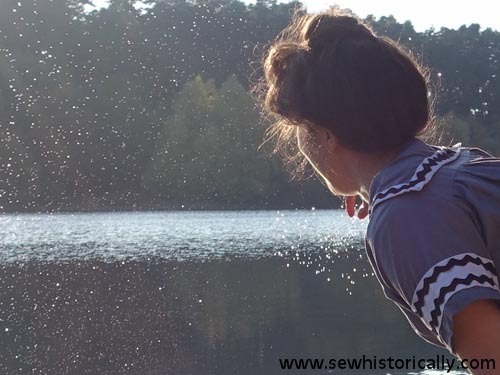 Wool was usually used for Victorian and Edwardian bathing suits because it’s supposed to be warmer than cotton when wet, wool fabric is a sturdy material and it’s easier to dye – especially dark colored cotton fabric bled color when wet and stained the skin. Woven wool also doesn’t reveal the figure as much as cotton when wet. An advertisement of a mohair bathing suit in the 1908 Sears & Roebuck Catalogue says it “sheds water well and does not cling to the figure” (source). Good to know! Thanks for sharing all this info with me. I really love your bathing outfit! It is so beautiful and becoming. I am so very tired of seeing women wearing outfits that are nothing but glorified underwear. Where did you get the pattern for your bathing outfit? Thank you! 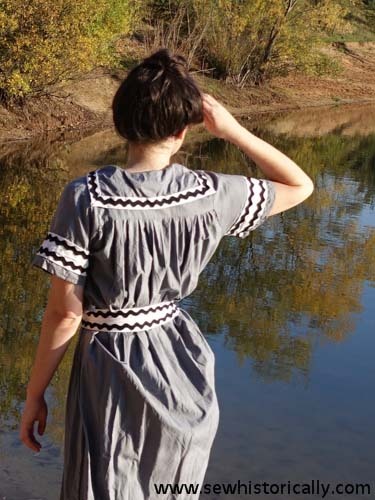 I drafted the pattern myself based on Edwardian bathing suits.